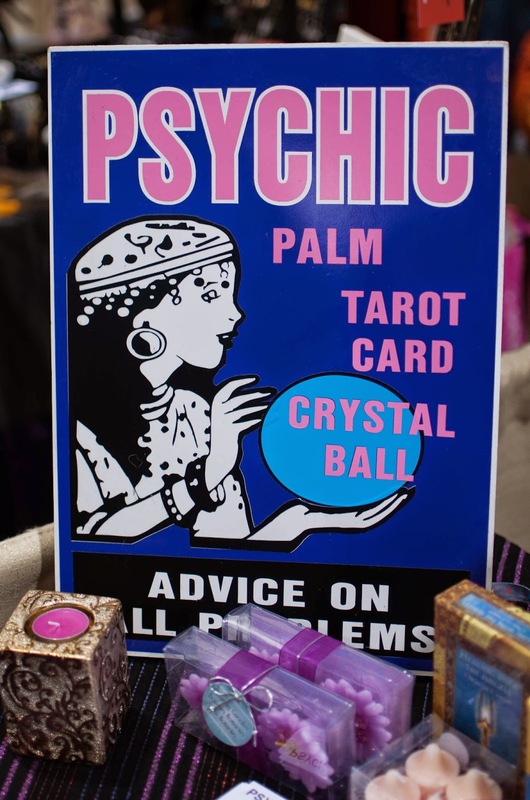 The Mississauga Psychic Fair, now in its fourth year, is organized by First Star, a project by Stan Mallow and his business partner, Ray Fulcher. Mallow, a host of a television series out of Niagara called “The Paranormal Show,” is affable, friendly to skepticism, and even leaves me tickets at the front counter so that I can go explore. The event looks much like I thought it would. 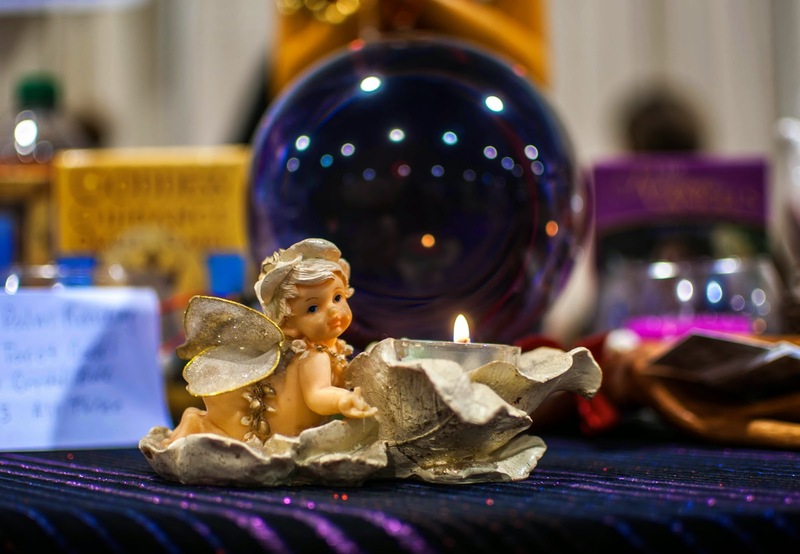 The conference room, not far from Toronto's main airport, is carpeted in booths and draped with signs, silks, crystal balls, angel figurines, gems, and other tchotchkes. The crowd – surprisingly diverse to my eyes – is in constant motion, although here and there I can see people talking earnestly and animatedly to various psychics. 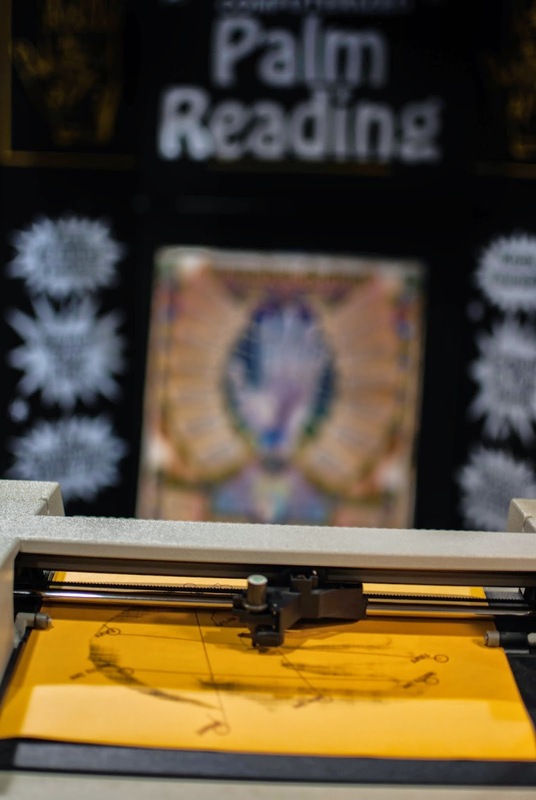 As I watch, a woman starts to sniffle; the man who is reading her tarot cards quickly brings out a box of tissues from under his table in a practiced motion. I sit down at a table with a placard that reads “Tarot Anne” and smile at the woman there, presumably Tarot Anne herself. She smiles back. I like the way she looks: henna-red hair, half-lens glasses that she looks at me over, and simply dressed. She could be somebody's friendly mom, not a moony spiritualist. “Pick some stuff from my box of junk,” she says, dumping trinkets onto the table. “We'll figure out where to go from there.” I'm supposed to pick out four objects, so I do, and she reads them with the help of tarot cards. I'm going to write, she tells me. I'm going to do well communicating ideas to others. Every single psychic or card reader I've ever talked to has told me this, and I figured it out long ago: I always have ink on my hands. “I do. It's about my dog," I say, "he died,” and to my embarrassed horror my voice breaks and I tear up. She brings out a box of tissues from under her table in a practiced motion. This is better than a therapist, I think, sniffling and wiping my nose. As I look around, I realize nearly everyone around me is crying. We're all here grieving lost loved ones and searching for some kind of assurance, beyond the heartache and the pain and the final awful goodbyes, the universe might really, finally, be all right. For a moment, I am cheered. But then I go to the hair reader. “Your hair carries memories of the past and the future,” he leers at me, licking his lips. “Is that a natural wave or a perm?” His helper, who as it turns out is also his girlfriend, tosses her long hair over one shoulder and waves me into a seat. “Can I touch your hair?” he asks, leaning directly into my face. He has the strangest eyebrows I have ever seen, like a moustache over each eye, but brushed straight up toward his scalp. He is not right, but I shrug noncommittally anyway. I want to see where this goes. He grunts and rolls a lock of hair between his fingers. “Are you sure this is your natural wave?” I nod as well as I can with my hair in his fist. That part, at least, is true. He leans in even closer. As he pronounces the p in period, a little blob of saliva sails out of his mouth and directly into my eye. I try not to think of ocular lesions and bacterial infections. Mercifully, the reading is now over, so I rush away. For the rest of the day, I hurry past his booth and avoid eye contact. Allison Boswell's story is particularly interesting. She was just a normal person, if a little bit dreamy, working in a normal business, she says. She was never particularly skeptical, but she was never particularly superstitious, either. She just hung out with her husband and worked at her job until a month after her 29th birthday, just a few months ago. Then, one day, she started seeing ghosts everywhere. “With all due respect,” I begin to ask her, and don't know how to finish. I involuntarily take a step back, then clear my throat and remember the ink on my hands. But then I look at my hands, and there isn't any ink on them. I end up spending six hours at the Mississauga Psychic Fair, mostly enjoying the people-watching and the massage chairs. But my favorite part comes as I'm leaving, when I pass by the hair-reader's booth to see him trying to make a sales pitch to a large, unimpressed-looking man, who is completely, neatly bald.